Die Mighty Pressure Crew lädt zur zweiten Ausgabe der Blackforest Bassculture! Zum zweiten Geburtstag haben die Dudes keine Kosten und Mühen gescheut und sich Radikal Guru als Special Guest eingeladen. Damit auch jeder tanzfaule in Bewegung kommt bringen die Digital Steppaz nicht nur feinsten Sound sondern auch noch ihr Soundsystem mit an den Start. Selecta Stony von Dogtown Hi-Fi rundet das ganze mit einem Reggae Warm-Up ab. Auf dem zweiten Floor gibt es Raggajungle, Deep-DnB und ein extra langes Set von Dj Freemerge. Beginn: 22 Uhr Pfeffi am Einlass: Solange der Vorrat reicht! 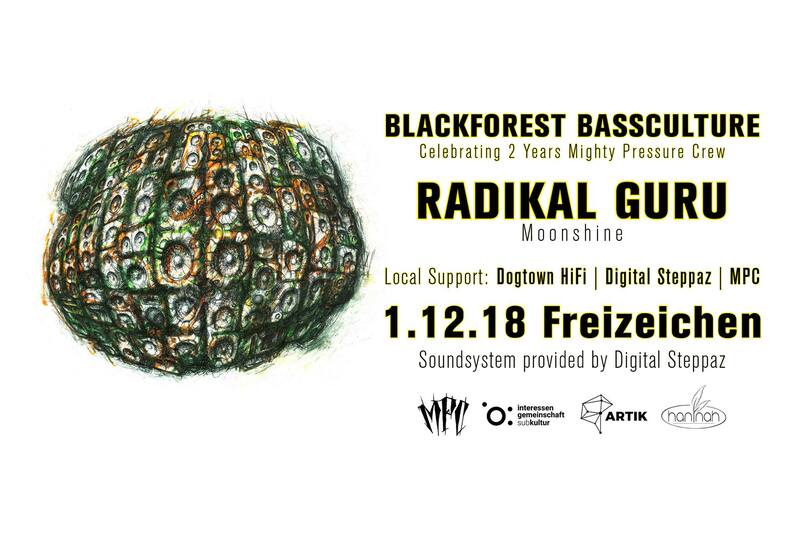 The Mighty Pressure Crew invites you all to the second edition of Blackforest Bassculture! For the celebration of their second birthday they have invited a Dubstep Legend: Radikal Guru. The Digital Steppaz will not only provide a unique selection of music, they are bringing their heavyweight soundsystem to the party! To warm up the massive Selecta Stony from Dogtown Hi-Fi is going to welcome you with a special Reggae-warmup-set. On the second floor the Mighty Pressure Crew will play Raggajungle, Deep-DnB including an extra long Set of Dj Freemerge. Doors: 22pm Free Shots on Entrance as long as in stock. Only 15 min walk from Trainstation. La Mighty Pressure Crew invite encore une fois à la Blackforest Bassculture! Pour le deuxième anniversaire, les mecs n’ont pas regardé à la dépense et ont invité Radikal Guru comme special guest. Pour que même les plus grands faignants se mettent en mouvement, les Digital Steppaz amènent pas seulement leur meilleur son, mais aussi leur système de son. Selecta Stony de Dogtown Hi-Fi va parfaire la soirée avec un Warm-Up de Reggae. Au deuxième floor, il y a du Raggajungle, la Deep-DnB et un set extra long de Dj Freemerge. Début: 22h shots gratuits à l’entrée jusqu’à épuisement des stocks ! Seulement 15 mins de la gare de Freiburg. Not only a talented producer, Matt is also a fine selector and deejay, conveying his passion for music through DJ sets that pay homage to the sound and culture’s rich history as much as they showcase the freshest cuts of sonic innovation from himself and his contemporaries. He has hit spots all around the world as far afield as Russia or South Africa to assault soundsystems with bass-fuelled beats and positive vibes, including recent gigs in the US, Mexico and Australia.